Known simply as The Orange, a 14.82 carat, pear-shaped vivid orange diamond sold at auction at Christie's for $36 million. This was the second large, colored stone to be sold this auction season. The other was Pink Dream, a large, oval pink diamond, which netted $83 million at Sotheby's. Colored stones have been gaining in popularity, and people no longer insist upon white diamonds, but are rather looking at colored diamond engagement rings as well. Colored Diamonds are referred to as Type II stones, and that means that when they were formed, elements such as nitrogen or boron were included in the diamond crystal, giving the stone a different color. Color in white diamonds is graded on a scale from D to Z, with D being perfectly clear. Faint color is considered a flaw in a white diamond, but highly colored stones are very valuable. Colored diamond engagement rings are growing in popularity all the time. The largest fancy-vivid orange stone in the world is known as The Orange and recently sold for $36 million at Christie's auction house in Geneva, Switzerland. 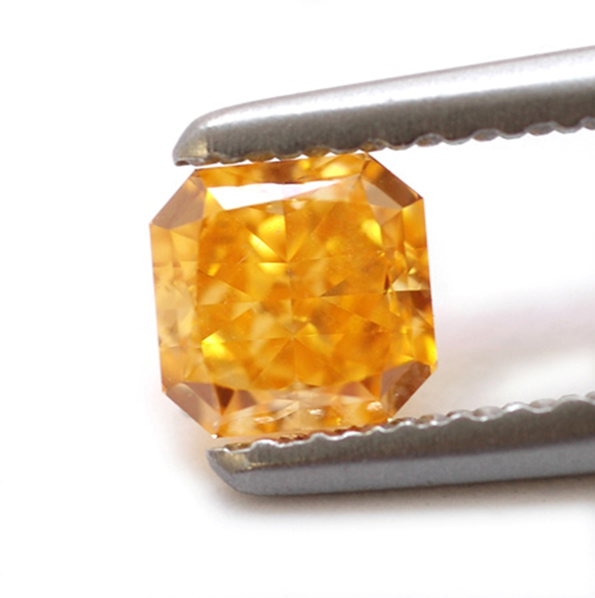 The Orange weighs nearly 15 carats and is cut into a pear shape. Another large orange diamond, appropriately called "The Pumpkin," sold for $1.3 million at Sotheby's in 1997. White, blue and pink diamonds are often brought up for auction, but orange stones are not seen very much. Unusual jewelry, such as colored diamond engagement rings, sends the message that you are not afraid to break away from the crowd. When considering colored rings, keep a few things in mind. With white diamonds, the clearer the better, but with colored stones, the deeper the color, the more valuable the stone. You will have this ring for a long time, so pick a color that means something to you. Perhaps you want a diamond that is similar to your birthstone. Maybe sunny yellow is your favorite color, or perhaps you were engaged on Valentine's Day, so you choose a pink diamond to honor that. You can mix colored diamonds with white stones for a dramatic effect. A large blue or pink diamond surrounded by small white ones looks especially striking. Be sure to purchase your colored diamond ring from a reputable jeweler. Colored diamond engagement rings are sometimes altered to make the color appear deeper and the stone seem more valuable than it actually is. All stones sold by Juno Jewelry are certified natural and conflict-free. Colored stones can be substituted for the white diamonds in any of our hand-made settings. We can also create a custom design to your specifications. To explore the exciting world of colored diamond engagement rings, contact Juno Jewelry today.